Abstract : Along the way of serving B&R construction, Chinese enterprises redefined brand value by providing the world with cutting-edge technologies and high quality products and services, which made them rise fast in global brand value ranking. BEIJING, Jan. 15 (Xinhua) -- Chinese enterprises were actively participating in the Belt and Road (B&R) construction in 2018 as China’s efforts of going global intensified, helping facilitate economic and social development of the countries and regions along the B&R routes. Along the way of serving B&R construction, Chinese enterprises redefined brand value by providing the world with cutting-edge technologies and high quality products and services, which made them rise fast in global brand value ranking. There are much more to expect from Chinese brands as they expand presence along with B&R construction, experts say. Chinese enterprises have risen fast on global stage with the advancement of B&R construction, and thus enhanced global influence and climbed fast in global brand value ranking. A total of 14 Chinese brands made into the BrandZ Top 100 Most Valuable Global Brands in 2018, compared to only 1 in 2016, with total value of China’s Top 10 soaring 47 percent year on year, more than double the pace of U.S. brands, according to global advertising and public relations company WPP and brand consultancy Kantar Millward Brown. 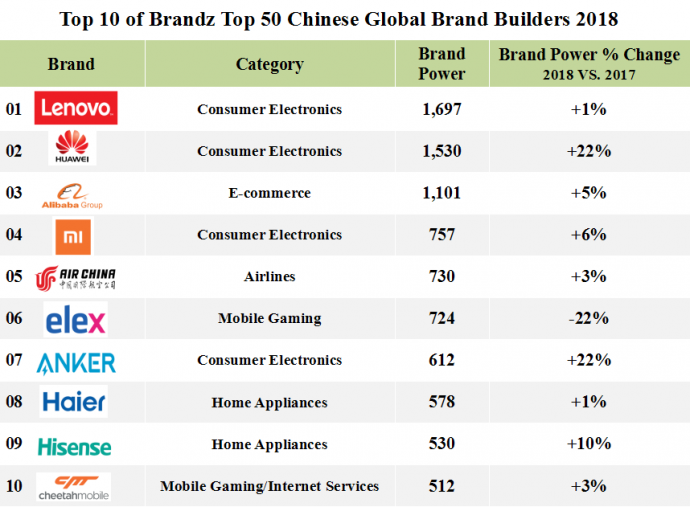 WPP and Kantar Millward Brown also present BrandZ Top 50 Chinese Global Brand Builders in 2018 which ranked Chinese brands in terms of overseas influence. London-based market research firm Brand Finance also released its Brand Finance Global 500 report in earlier 2018 which showed that China's global brand value grew to 911.5 billion U.S. dollars in 2018, ranking the second and narrowed the gap with the United States. Particularly, the report showed that Wuliangye, a Chinese brand of aromatic liquor, grew a striking 161 percent year-on-year to 14.6 billion dollars, and was tagged the fastest-growing brand comes from China. An increasing number of Chinese brands are becoming global brands and the growth of Chinese brands has become a “standout” story, David Haigh, CEO of market research firm Brand Finance, told Xinhua. Behind the shining medal is the dedication of Chinese firms in redefining their stands when competing globally. As China's leading home appliance maker Gree president Dong Mingzhu put it at the 2018 Boao Forum for Entrepreneurs, the value behind the brand is quality and the spirit of craftsmanship. In fact, Chinese enterprises are growing fast with advanced technologies, high quality products and services, recognized corporate social responsibilities (CSR) and even in many cases, become rule makers by participating in setting down international standards. State Grid, for instance, registered 14 new standards of International Electrotechnical Commission (IEC) and Institute of Electrical and Electronics Engineers (IEEE) in 2018. So far, the company has led the compilation of 61 international standards and officially released 30 such standards. The Chinese standards have helped some B&R countries to further improve their technical standards. “For example, we helped Brazil power grid improve its capability of power control and protection with our standards , raising its correct relay protection rate from 75 percent to 90 percent,” said Shu Yinbiao, Chairman of State Grid. In the medical sector, Haier Biomedical, an association of Haier Group Corporation, has built a sharing platform covering vaccine network, blood network and biological sample network, aiming at promoting the health industry in B&R countries. Its innovative solar-powered vaccine refrigerator has been selected into the World Health Organization (WHO) procurement catalogue. It also became a long-term supplier of UNICEF, providing a strong guarantee for children’s vaccination in Africa, a contribution that won it the honor of 2018 B&R CSR innovation case. “The core objective is not just for China’s companies and their brands to reach global audience. It is for those companies to change the way that people around the world think about China’s brands”, according to David Roth, CEO of the Store WPP, EMEA&Asia and Chairman of BAV Group. “Increasingly innovative and better quality brands are confronting the old China-stereotypes,” the CEO said.